Hello everyone! 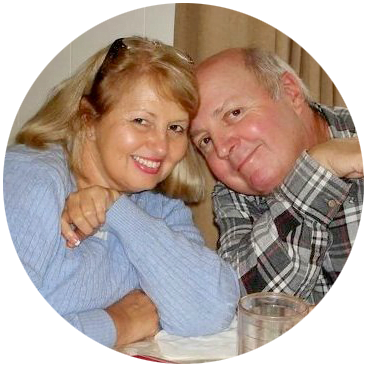 Dawn, Debbie, Ann, and I are back with the third installment of our Christmas Tidings Series. You can click here to see our Burlap and Grain Sack Projects and our Tablescapes if you missed those. 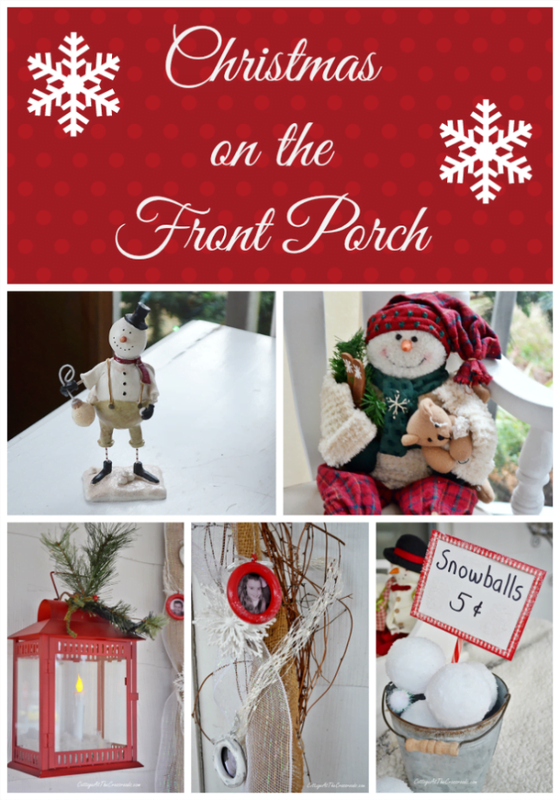 Today we’re showing how we decorated our front porches for Christmas and hoping to bring a little inspiration on how to extend the holiday cheer onto those outdoor spaces. 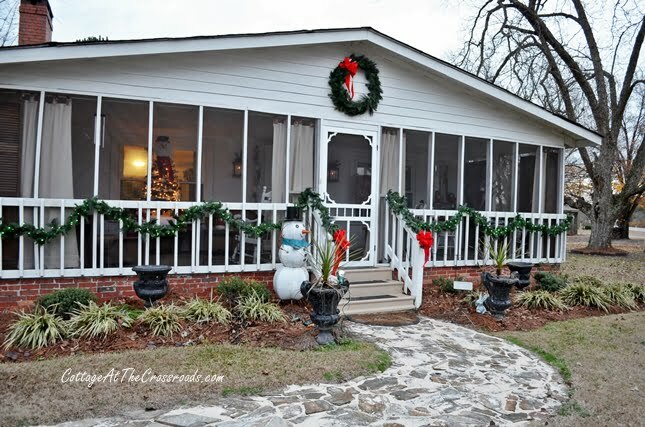 For anyone who’s new here, we have a large screened porch across the front of our home. And because we live in South Carolina, we can use our porch for most of the year except on those extremely hot or cold days. So to decorate the front porch this year, I decided on a “Winter Wonderland” theme. It’s a real wonder if we get snow here so I decided to bring a little to us! 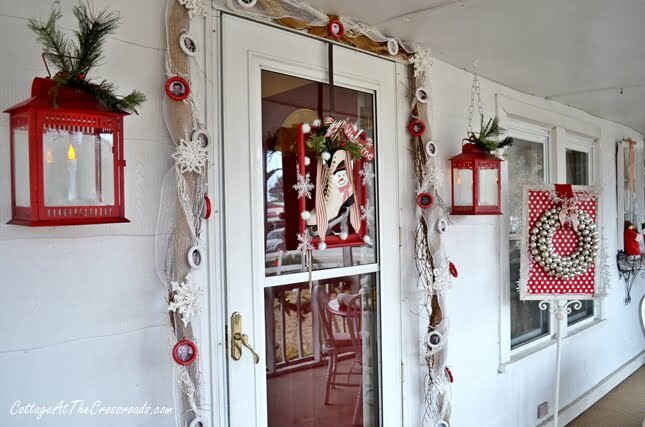 The first thing that you’ll see after you step up onto the porch is this garland around the front door, our new red lanterns, and a skate wreath. There’s even another wreath on a metal stand beside the front door. The grapevine garland has been around our door for a whole year. I put it up last year when I was decorating the front porch for Christmas, and I’ve used it for every season since. This year I added a photo of everyone who comes to the Crossroads on Christmas Eve. 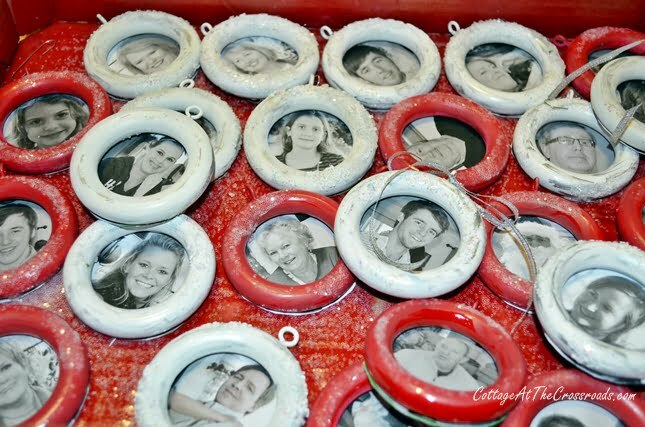 I made the ornaments by painting some old wooden curtain rings and gluing photos on the back of them. I had to trim them a little bit before hanging them, though. 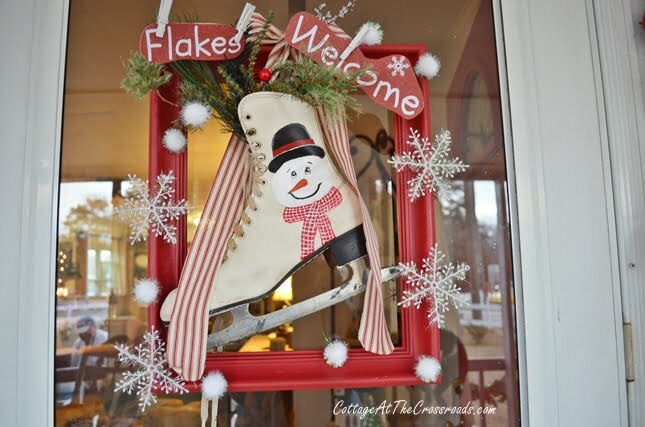 You may have already seen the skate wreath on our Christmas Home Tour, but I was really proud of the way it turned out. I picked up the old frame and the skate at the auction that Leo and I go to just about every week. The snowflakes came from the Dollar Tree, and the snowman on the skate was hand painted by yours truly. I love, love, love our new red lanterns, and they will stay on the porch year round. The battery operated candles work great and you can even see them from the street. On a table there’s a snowman tree with a little “snow” underneath. A few days ago, I was taking photos late in the evening and captured the “blue hour” which I didn’t even know anything about until I started blogging! 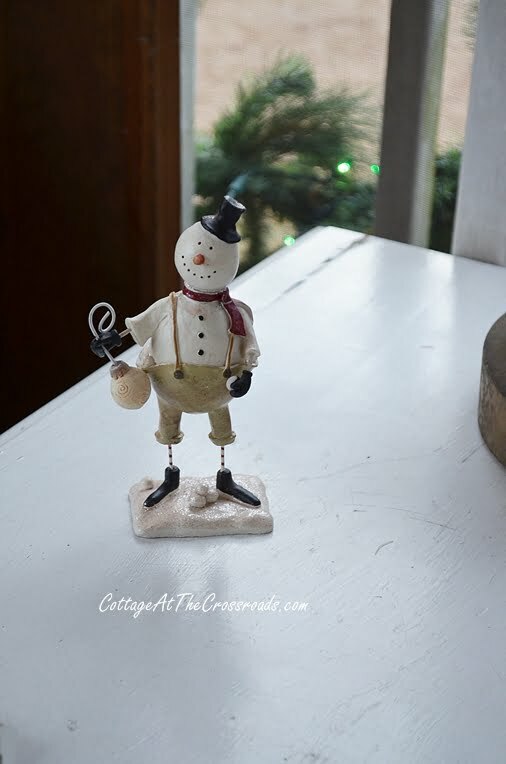 On one end of the porch, I tried to create a snowy, wintry scene but putting up some “icy” garland, a tree with snowflakes, and more snowmen in the little planter on the wall. 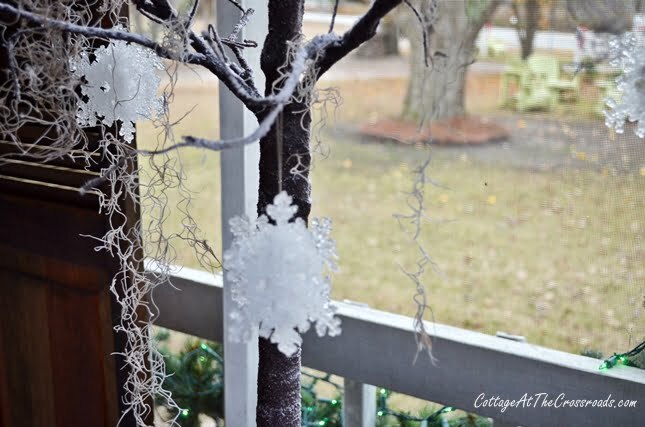 I spray painted the Spanish moss white, and you really can’t tell but the overall effect is very wintry. 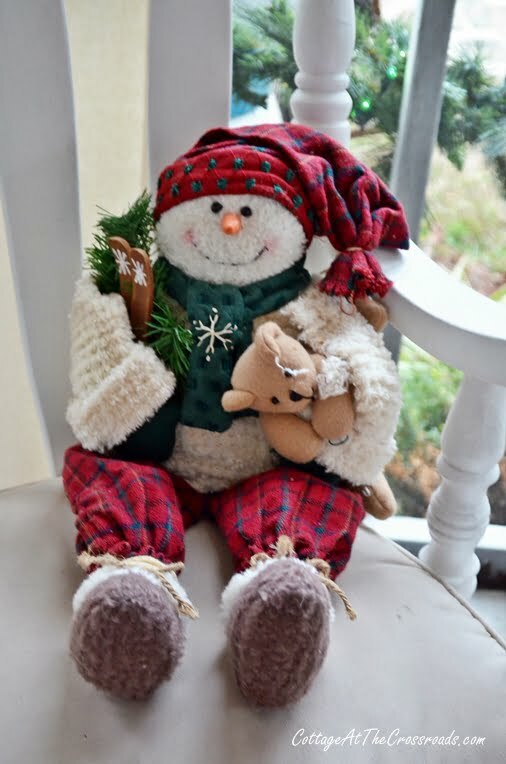 Here’s another cute snowman in a rocker. And a miniature cabinet is on this table as well. 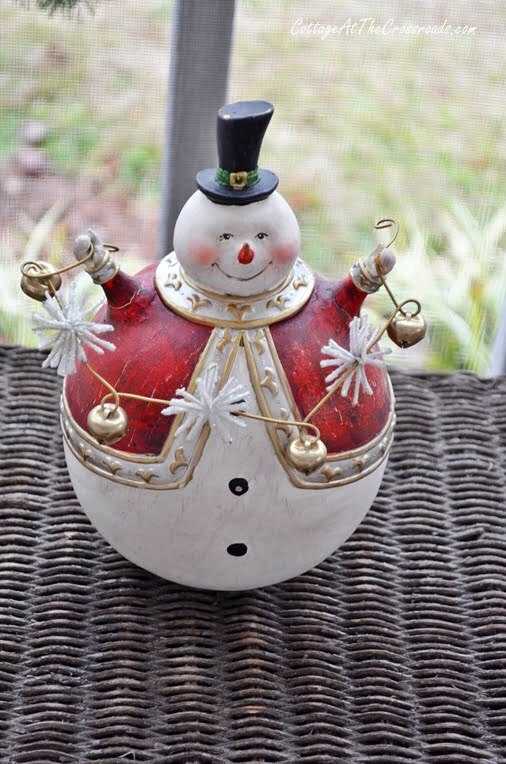 And I’m glad I found a spot for this little “roly-poly” snowman! Have you noticed? 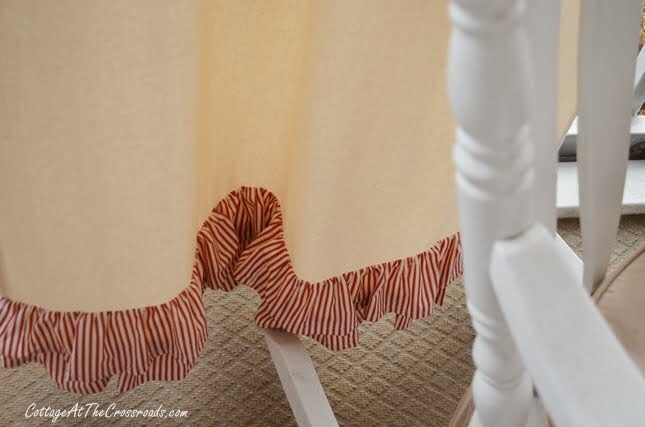 We have new curtains on our porch with red ticking ruffles. 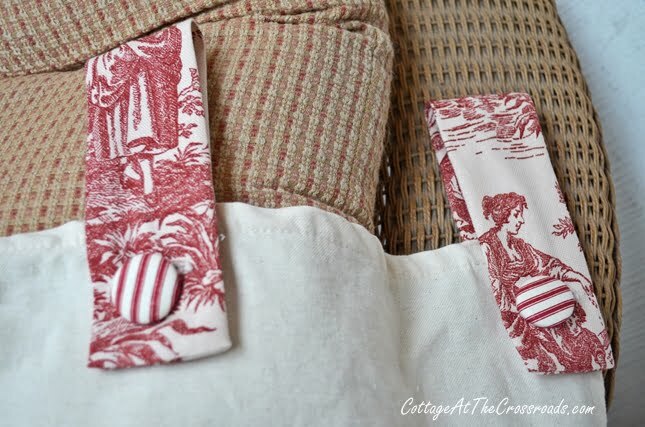 They’re made out of muslin with red toile tab tops. My friend Brenda, who made my ruffled stool cover, made these as well. I’m sorry I couldn’t get a decent picture of them hanging. It’s been dark and dreary here for days! On the table that’s on the porch, I created another little snow scene with this bucket of snowballs. It’s so easy to make them. 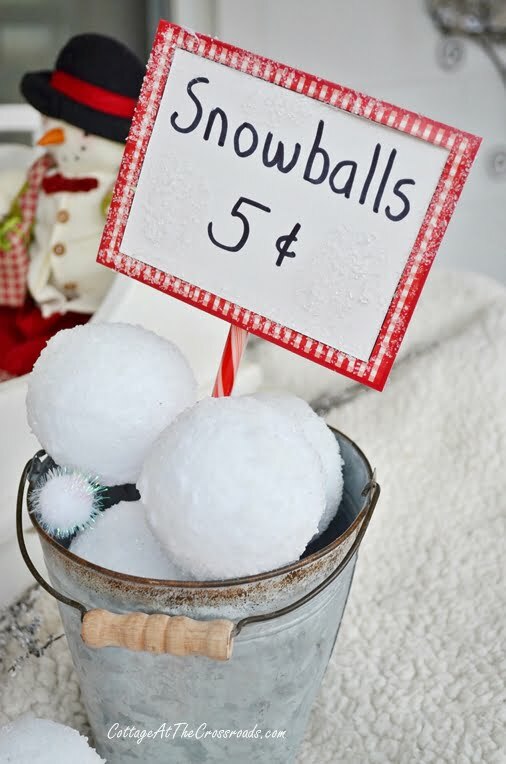 Just roll some Styrofoam balls in watered down white glue and then Epsom salt and let them dry overnight. They look amazingly like the real thing! Thank you for visiting and remember, it’s not too late to decorate your porch! I’d especially like to thank Mary and Dave from Front Porch Ideas and More for featuring our porches on their site. 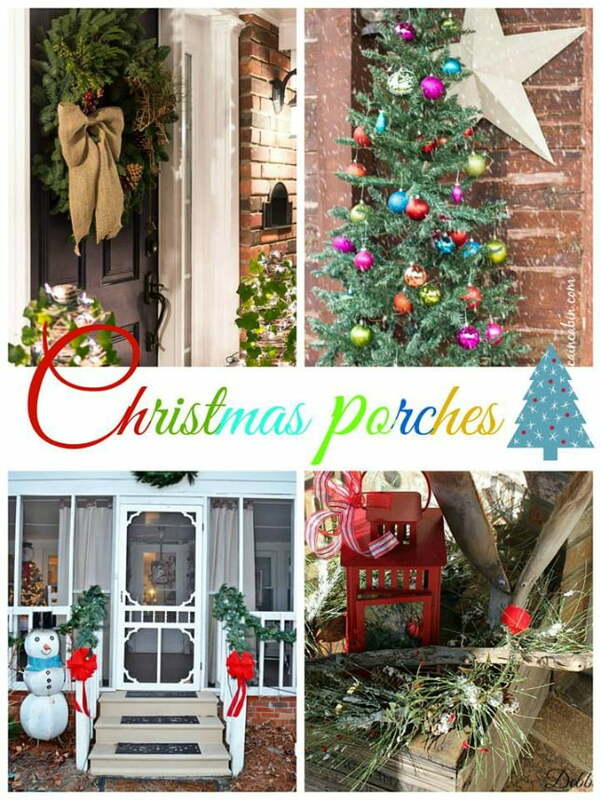 You can click over there to see lots and lots of decorated porches as well as follow them on their Facebook page Front Porch Ideas. 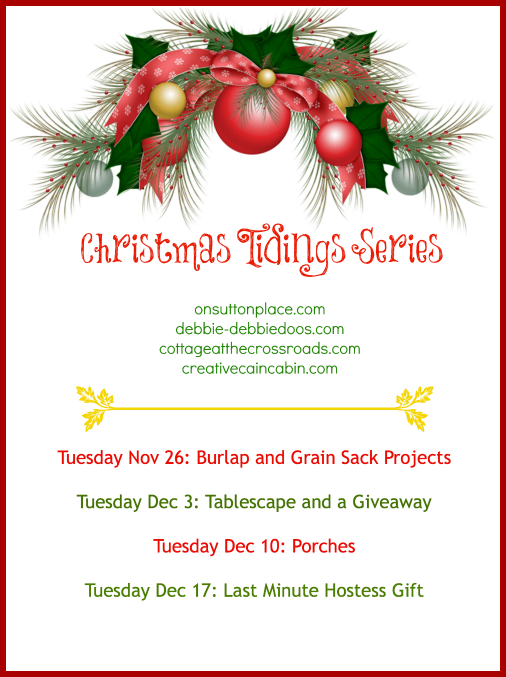 And to see Ann, Debbie, and Dawn’s porches, click on the links under this graphic. I love all of the red and white. It is so calming and pretty together. Wow! Great job. It looks like a ton of work! Everything is soooo cute and I love your idea of spray painting the spanish moss. It really does look so wintry and very elegant. Love it. Thank you for all of your hard work. You make our home cozy and beautiful but most of all you make our home a home. I love ya. Jane, when I saw this in my inbox, the first thing I said, “I can only imagine what she has done”. 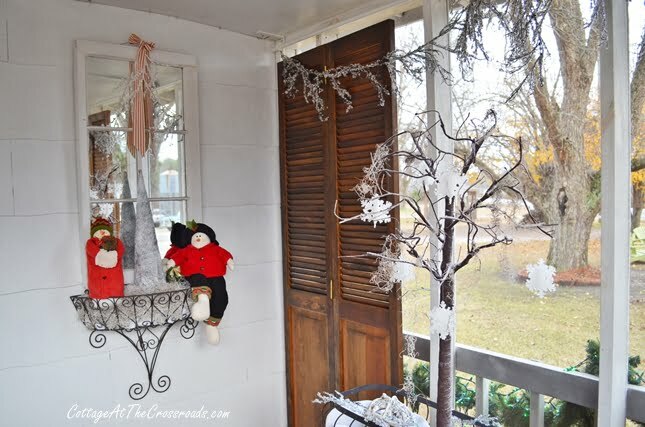 Fantastic, love the snowmen theme and the garland around the door with the cute pictures of family. Beautiful touch! 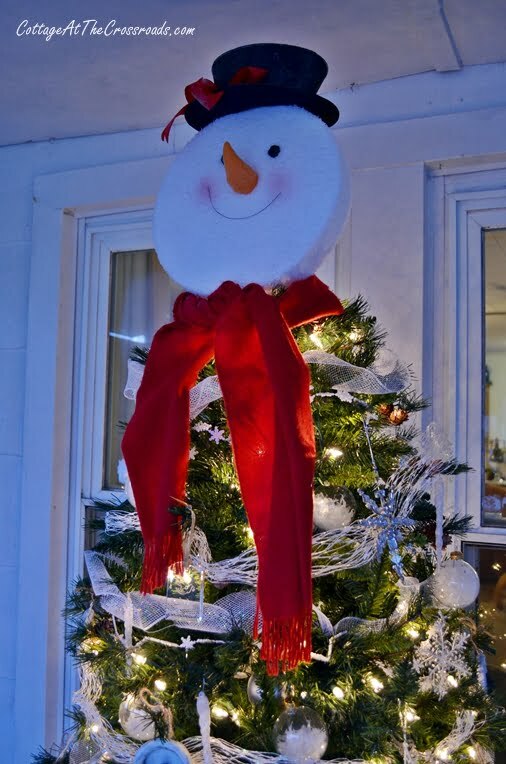 I love your curtain rings photos and all the adorable snowmen. 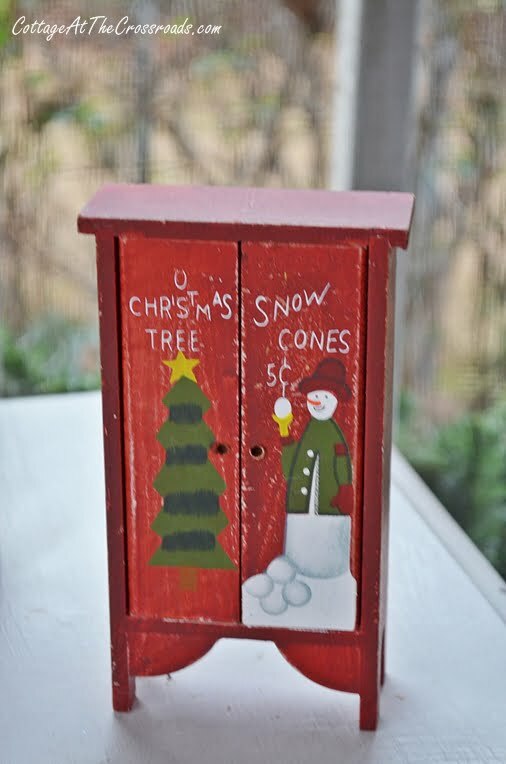 Love everything about your festive porch…and the bucket of snowballs are adorable! !…and you know what my favorite is…that wonderful family garland!!! Your porch is gorgeous! 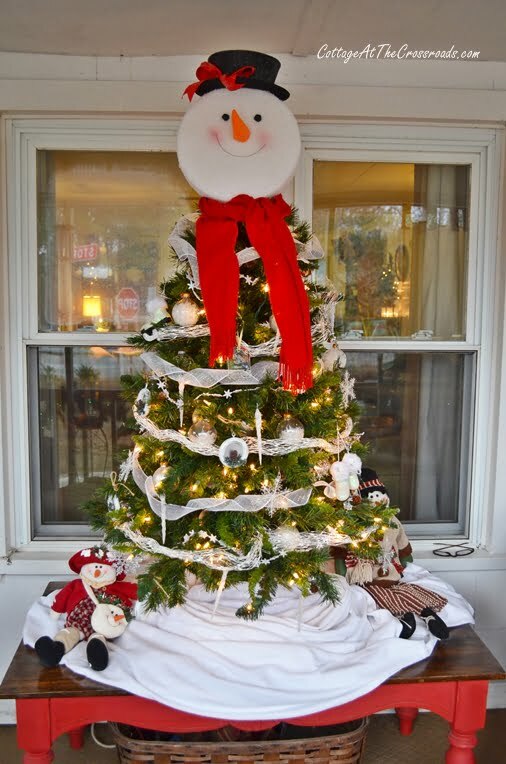 Love the snowmen, the tree, the curtains…….everything. Beautiful! Very festive! 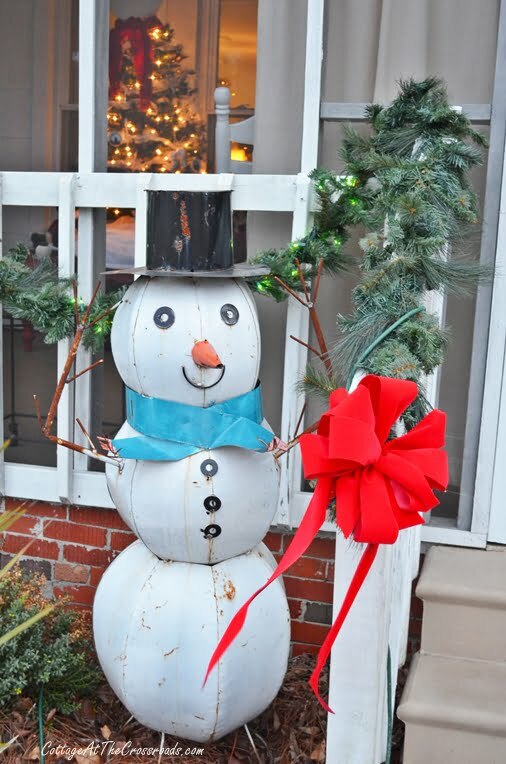 I am a snowman lover so I am coveting that metal snowman! Looks great Jane ! Love all your snowmen ! The skate in the frame is fabulous ! What a fun porch! Love love your red lanterns and the cute snowman. 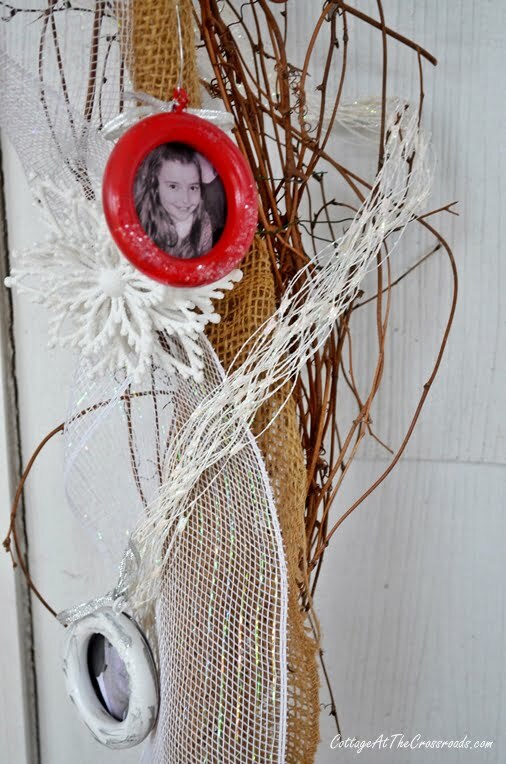 Great idea for using wooden curtain rings on your grapevine garland. Hope you’re having a great week. Your porch looks so pretty, Jane! I love the garland of pictures around the door. What a sweet sentiment & very clever to use curtain rings for the frames! Jane, you sure have outdone yourself. 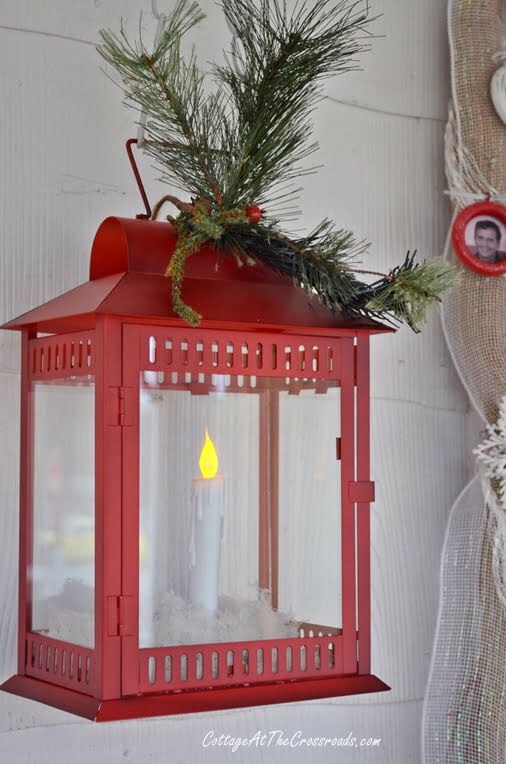 I love the new lanterns they are perfect for Christmas and the tin snowman is darling. I have been looking for one like it that is all rusty. Your porch is delightful. Love love love Jane. SO stinking cute, not sure what I love most. I really love the skate! on the door. Hey we need to check those url, some are wonky? sorry LOL!